It is our pleasure to invite all researchers to submit their articles on the EC FP7 APRAISE Special Issue “Assessment of Policy Interrelationships and Impacts on Sustainability”, published in the International Journal of Mitigation and Adaptation Strategies for Global Change, by Springer. The Author Guidelines for the manuscript preparation are available here. The submission deadline for prospective authors is 10 January 2015. Have a look at the APRAISE article in the JIQ Newsletter: October 2014 here. Download the Conclusions from the Final Conference here. 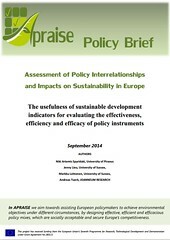 The APRAISE Policy Brief has been released! Read more on the unanticipated effects of environmental policy making here. Download the 7th APRAISE Newsletter: September 2014 here. The APRAISE Synthesis Document presenting the results of the APRAISE 3 years of operation has been released! The APRAISE Synthesis Document is available here. Watch the 2nd APRAISE Video here! Download the Appraise Final Conference Agenda here. Download the Appraise Summer School Synthesis here. The APRAISE Policy Workshop has been implemented on the 23rd of May 2014, in Brussels, Belgium. The Workshop was entitled “Policy Making beyond Modeling – Lessons from the APRAISE project on the Limitations of Models for Environmental Policy-Making” and had as a main goal to discuss as to how far modelling can go to support policy makers in designing effective environmental policies. More information is available here. 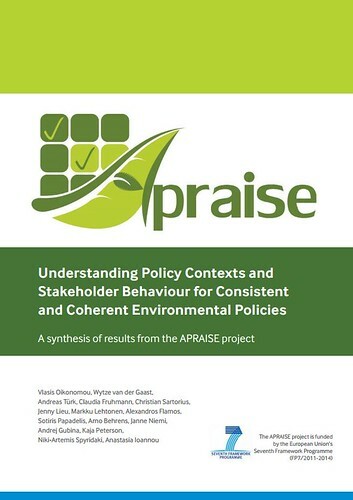 Find here the APRAISE report on modeling outcomes of policy scenarios, accompanied by two explanatory presentations. Download the APRAISE Proceedings of the Stakeholder Consultation Workshop on Modelling Results here. Download the APRAISE D6.1 Dissemination and Communication Plan (Version 3) here. Download the latest JIQ Newsletter: July 2013 here. Download 3rd APRAISE Newsletter: May 2013 here. Download the JIQ Newsletter: Winter 2012/2013 here. Download the APRAISE project deliverables: "Report on new qualitative ex-post and ex-ante evaluation methods" & "The APRAISE 3E method" here. View the photos from the APRAISE Intermediate Meeting, November 2012 in Graz, Austria here. View the photos from the 1st APRAISE Internal Meeting, 2-3 July 2012 in Groningen, Netherlands here. Read the APRAISE article in the monthly magazine “European News”, issue November 2013, published by the European Office of Cyprus, introducing readers to the APRAISE project, while briefly presenting the APRAISE methodology in English or in Greek language.